I have often complained about advertisements about gaming that obviously were created by non gamers who have no clue. 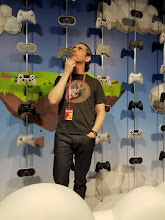 You know what I am taking about, cool stylish people holding the controller wrong, slack jawed idiots screaming while they play or older people trying to look hip. I have often wondered why these companies don't hire a consultant (say...me for example) that could recommend the best angles holding styles and expressions for gaming pictures and scenes. Movies and TV shows suffer greatly from this as well, even Big Bang Theory which talks about geek culture all the time completely mishandled a World of Warcraft scenario where the gang raided for 'the Sword of Azeroth'. The way they were playing (and the opponents) were completely false as any Wow (or MMoRPG player could tell you). In between parties with Paris Hilton and marathon rounds of doing Cocaine we enjoy a quick round of the PacMen on our gaming unit. It is encrusted with diamonds...of course. 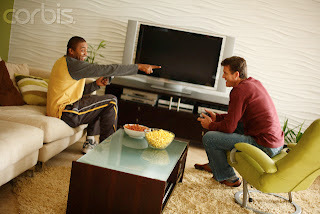 Dudes...you look l33t and all, and I am sure you play a mean Street Fighter, but, Umm THE TV IS OFF!!! I love the one with the boy and the cookie TOO MUCH AWESOME! love the pretentiousness of it all.